At long last! Everything is proceeding exactly as I have foreseen! I am thrilled to share with you the cover design for my first novel, THE DARKER SIDE: Musings of the Master. 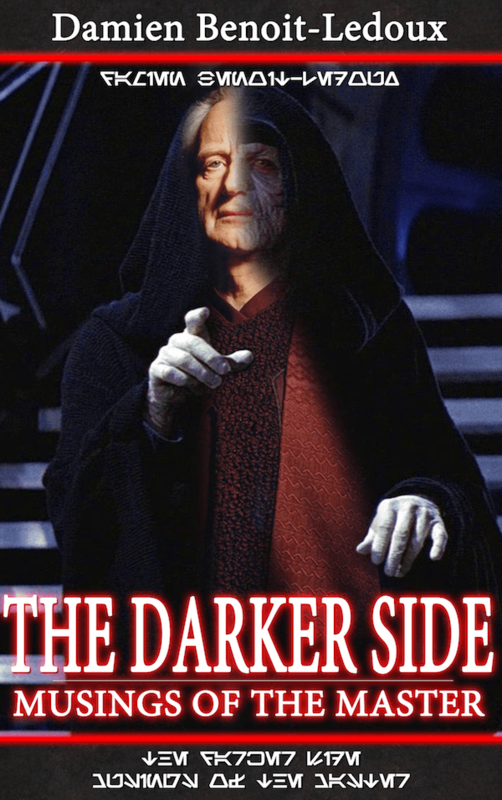 Synopsis: Emperor Palpatine’s spies discovered Darth Vader’s personal journal (The Darth Side: Memoirs of a Monster by Cheeseburger Brown) hidden away in private databanks onboard his flagship Super Star Destroyer Executor. Quietly upset by Vader’s musings and distractions, the Emperor set out to journal his corrections to Vader’s successes and failures—and share the true purpose behind everything he did for the greater good of galactic peace.